In the future, advanced robotics has created heavy robots ("labors") for use in a variety of functions: construction, fire-fighting, military, and more. However, though the robots are only machines, their operators are also only human—and humans sometimes turn to crime. Since a heavy labor unit can be a dangerous weapon, the police of the future are set to fight fire with fire, using advanced patrol labor units, "patlabors." This is the story of the Second Special Vehicles Division, a motley crew of patlabor policemen and women doing their best to fight crime and live a normal life. I have no interest in writing reviews, but I felt that Patlabor deserved something more positive. So here is one that is short, simple and from the heart. Patlabor the TV series is not about excitement or being heavily psychological. It is a very human show. It’s less about getting hyped up over battles and more about relaxing with your buddies Special Vehicles Section Two. The simple actions and gestures of various characters are well thought out, making them truly believable. The whole cast have their own individual personalities and ways of reacting to things. None of them seem like cardboard stand-ins in the background, something that anime is rife with. It is enjoyable to switch on an episode and see what the group gets up to next. As you spend time with them you really get to know them well, and even feel like a part of it. The art and sound in the remastered version are very good. Patlabor is a pretty famous anime from back in the early 90s [I think even part of the 80s]. This was when Mecha animes were at an all time high and it was all about military or police mecha and stuff. Patlabor really stood out because they didn't go off the deep end with the fantasy&mdash;meaning, they don't transform, they don't talk, they can't fly [usually] go into space or the deep ocean, they don't carry endless racks of missiles.....you catch my drift? YEAH, it's pretty obvious that Patlabors don't exist but my point is that this story kind of handled it with some sense of reality like it's just another vehicle like a forklift or crane or some other construction vehicle. Even though the show is kind of old school, and the stories are kind of simplistic which is ALWAYS centered around some kind of mecha/Patlabor, it is still an alright anime to watch and does have it's share of funny and dramatic moments. Totally old school anime art style which I love! Vintage anime art is the best! But I'm not the best when it comes to grading machine art and movement since machines don't speak to me on that emotional level like it does for so many others.....so I'll leave that to those who are more or less into that. OK right off the bat I gotta say that the English Dub was terrible, I'm pretty sure that the reason why anime fans get hostile when you talk about dubs has to do with the legacy of shows like this one where the voice acting was not bad but HORRIBLE. The main character, Noa, her voice is probably the worst with her hi-pitched, ever-so-perky tones. Also some of the male characters actually sound 'slow' or retarded. The acting was either too weak or over the top, either they were overreacting to some petty issue like Ramen noodles or some lame sporting event or they UNDER-reacted to the real vital issues like terrorist threats and other battles. It kinda make me wonder if they even did any line reading for the actors or was there even an auditioning process at all or did they just start picking random readers off the street? Also, I wasn't too crazy about the songs either since they sounded really dated.....but by the 15th episode I thought the OP was kind of cool singing along in my horrible Japanese &quot;So Never cry, Itsumo...kimi wo...la la la-la-la! I also liked the animation and how the characters looked for the opening credits. Ridiculous....funny but definitely ridiculous I never saw this show when it originally aired so there really isn't any of that nostalgic bias that always seem to accompany reviews of vintage anime! No, this show is down-right silly at times but that does not mean that is a bad show and that you must not watch it., actually this is one of those shows that should be watched so that we can understand the evolution of the modern anime....specifically the mecha genre! This show is all about mecha, specifically the LABORS machines of the humanoid variety&mdash;ones that have two arms and two legs and all the drama they cause in modern society. Consequently there are the PATROL LABORS or PATLABORS that are supposed to minimize all of these new types of crime/criminal behavior. However the group over at PATLABOR Division 2 seem to create more havoc and drama than resolving them......and that's where all the hilarity kicks in. Honestly sometimes it's funny and sometimes no, but I really think it's because of the very, very bad voice acting. I never really understood the importance of comedic timing until now, like a lot of the jokes kind of just fizzled because the speed and delivery was off or maybe the voice was just WRONG all-together! Also aside from the whole mecha thing, there is no real unifying theme or plot. Some stories did span a couple of episodes and others seemed linked because they carried a character from a previous episode, but for the most part there was some sort of resolution offered at the end of the 20 or so minutes and by the time ending credits were rolling. This may annoy some people who dislike episodic anime shows. I didn't have a problem with it per se, just more the fact that I don't think it should have gone on for 47 episodes. Again, likable characters overall, it's just the bad voice acting which may affect you really liking the characters too much. Asuma Shinohara was my favorite probably because he's got the least annoying voice plus he's kinda cute, I also kinda liked the leader of Division 2&mdash;he was very mellow in that cool kinda way....but all the other guys are off the chart [not in the good way!] Noa's voice is way too perky for a cop and it's bit on the whiny side but her personality is OK. All the other women in the show were good and believable. I think the best gem out of the whole series, has to be when Shige [one of the mechanics] goes to New York and he has to deal with Americans and they all look more like SS poster boys for Nazi-Germany than actual Americans and then that one token ethnic dude who's supposed to be Native American, I guess, with that solitary feather sticking out of his headband. It's funny but at the same time I found it mildly offensive, I think....but then again it WAS only a dream, lol! Standing at 47 episodes with an alternate expanded story from the original 1988 OVA series, Sunrise Studio 1 (MSG, Votoms) continued the fun and unique mech anime. It was directed by Naoyuki Yoshinaga (Maison Ikkoku) and script was by Mamoru Oshii (Patlabor OVA, Ghost in the Shell). This leads to believe right away, the animation should be decent; the characters should have more development, and the story should hold up to the original run. It does. Mechs, called LABORS, are used primarily for construction, and a crime division is made for the police force, dubbed Special Vehicles Division. The show focuses on the rambunctious division 2 and how they deal with their day to day lives. On the surface it seems just another re-hash of the original OVA, and in many ways it is. However, with more room to grow, and more mischief for division 2 to get into, the fun never stops during the three arcs Patlabor can be split into: one, the American Kanuka Clancy; two, the Schaft conflict; and three, to conclude it. This is how the show is broken down. Patlabor is a more character driven show as opposed to the average mech anime featuring never ending ammo supply, space battles, weapons that take out moons, and more. It is more realistic in a way that the mech is just a heavy machine run by a person. During the course of the anime, the viewer can slowly understand each and every character and enjoy the ride along the way. Each person is an individual without pre-set tropes and has their own way to reacting to situations. Animation and sound is pretty standard with the remastered being even better, but mech designs being truly unique in the show’s approach to the real-robot genre. Even the music depicts the era it came out of, and still gives the show a nice personality. With a solid unique take on real-robot mech anime, fun humorous characters, and normal day to day takes on division 2; Patlabor offers an enjoyable experience with some stories mixed in. This TV series take on Patlabor expands upon the developments of Section 2 implementing the mix of action, comedy and everyday developments facing the cast of the series compared to the first OAV series and first movie. While the series is mostly focused on the developments of main heroine Noa Izumi throughout the series, Patlabor still takes its time to focus on the other prominent characters of Section 2 from the manipulative superior of the group Kiichi Goto to impulsive gun-nut Isao Ota. The action element of the series involves Section 2's use of their Ingrim units in handling Labor threats that can be as mundane as construction labors to military prototypes wrecking havoc on the SDF's forces for illegal field testing. In particular, the latter makes for an ongoing plot where Section 2 and other police agencies try to find details on who is responsible for the testing of Labors against military units. However, it did feel like this particular storyline was left unresolved towards the middle of the series where the show went back to relying on its comedy and focus on Izumi's developments. The comedy for Patlabor had me drawing some comparisons to it with Police Academy as the personality quirks of Section 2 quite often got in the way of them performing their duties and they were considered the incompetent members of Tokyo's police force. Otherwise, much of the show's comedy comes from the usually unpredictable antics of Section 2 while both on duty and going about everyday routines in their headquarters, which I admit had me laughing on many occasions throughout the show when the show focused on them and the occasional bizarre comedy filler episode. The series can be an acquired taste for some viewers. 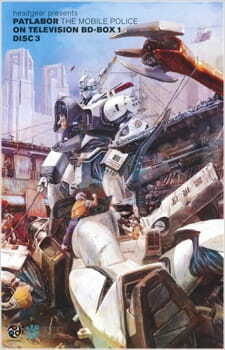 In terms of its approach to the "real robot" genre of mecha anime, Patlabor gets as real as it can get exploring the great lengths one has to go through to maintain Labors, minimize damage to any crime scene that police and military forces are employed to in order to handle Labor crimes and the financial difficulties of securing new Labors and parts needed to repair them. Action isn't so much the prominent element of the series compared to most mecha anime as it is more focused on the challenges faced by Noa and Section 2 while on duty and living normally. Depending on what you look forward to with mecha anime, you might find the series lacking in terms of grand plot and fighting scenes or find it to be a unique and original premise that makes a more down-to-earth approach to the mecha genre. In terms of visual presentation, Patlabor is standard quality for the time it was developed as a TV anime. Mecha and character designs are reasonably detailed with subdued color shading with animation that gets the job done in depicting crime scenes that Section 2 are called in to handle, though much of this is certainly outdated compared to modern anime titles. The soundtrack to the series does well to complement the comical and serious elements to it yet, with exception to the title's first OP song, there was nothing memorable that stuck out for me. Overall, Patlabor offered up a fun, solid mix of comedy, action and everyday developments facing the members of Section 2 while also offering up quite the realistic take on the mecha genre. Anyone looking for a unique and original take to the mecha genre should give this a look, especially if you have interest in looking into older anime titles.